When choosing your wedding gown, will you choose the couture experience, ready-to-wear, or something in between? To help make your decision, Stevie Newbegin from Wedding & Bride Magazine, speaks to the expert to find out what really goes on behind the seams. If you’re like most brides-to-be, the most exciting part of planning your wedding day will be choosing your gown. But before you run off and start the search, it’s important to research the different types of gowns available and become familiar with the bridal gown ‘lingo’ you will face along the way. This way, you can make an informed decision about which type of gown is best for you, and rest assured you will be happy and comfortable, and most of all, look stunning on your special day. 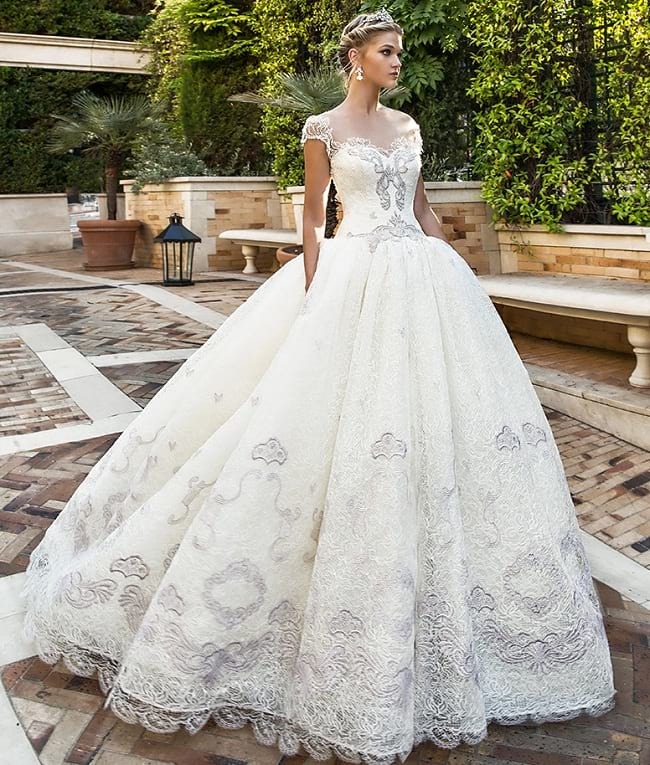 During your search you will be faced with a range of gowns from numerous designers and retailers who will offer you gowns of varying quality, price and design flexibility. You will hear the terms ‘bespoke couture’, ‘made-to-measure’, ‘made-to-order’ and ‘ready-to-wear’, and you may find that these terms differ between different people and businesses within the industry. While the definitions may vary, even to what we have labelled them as, the most important thing is that there are four distinct types of bridal gown experiences that you can choose from, which we have looked at here. BESPOKE COUTURE ‘Couture’ is the French word for ‘sewing’ and in the bridal industry it is used to describe gowns that are fitted and sewn specifically for a bride-to-be. A bespoke couture wedding gown therefore describes a gown which is one-of-a-kind, with a custom-fit. Bespoke Couturiers are the professionals that design, source the fabric, make the pattern, cut and sew a gown to your exact measurements, incorporating all of the requirements you need, including style, colour, fabrics and trimmings. Each Bespoke Couturier will specialise in their own signature style and technique. “Bespoke Couture, within my techniques, involves moulding and sculpting a gown to the body shape of my client to create the perfect fit. It is reliant on the layering of the bodice and the underlay materials used to create the perfect shape,” explains Josephine Romeo Bastone, the Bespoke Couturier behind Romeo Bastone Couture. “The true attributes of being titled a Bespoke Couturier lay in formulating the design where a sense of harmony between the gown and the body is established, and an impeccable cut provides the basis for a well-constructed gown.” Bastone has been in the industry for over 25 years and believes there is no substitution or comparison to having a Bespoke Couture gown created. “The justification of even paying slightly more for the experience and quality of a Bespoke Couture gown over any other method of purchasing a bridal gown is ultimately far more rewarding,” explains Bastone. So what’s all the fuss about? Well, it’s all about the perfect fit. Each and every woman in this world is different, and no two brides are exactly the same size. A Bespoke Couture gown offers you the perfect fit no matter what shape or size you are, where your dress will, literally, fit like a glove. As well as the perfect fit, you are getting a one-off gown made uniquely for you. As every aspect of the design is done in consultation with you, the bride, every detail is approved by you and if you want to change any details you can. Another benefit to choosing a Bespoke Couture gown is the quality of the materials. Only the finest fabrics, laces and embellishments are used, and any lace or bead work is all done by hand, boasting the highest quality workmanship. In order to create a "Couture Work of Art", you will need to work one on one with your Couturier and this will require multiple fittings and appointments. “A strong client relationship is of the utmost importance when creating a Bespoke Couture gown.